Marilyn Little and RF Scandalous. Photo by Shelby Allen. The very top of the CIC3* and CIC2* leaderboards at the Jersey Fresh International Three-Day Event remained the same since our lunchtime report, with Marilyn Little and RF Scandalous taking the top spot in the three-star and Lauren Kieffer and D.A. Duras taking charge of the two-star group. 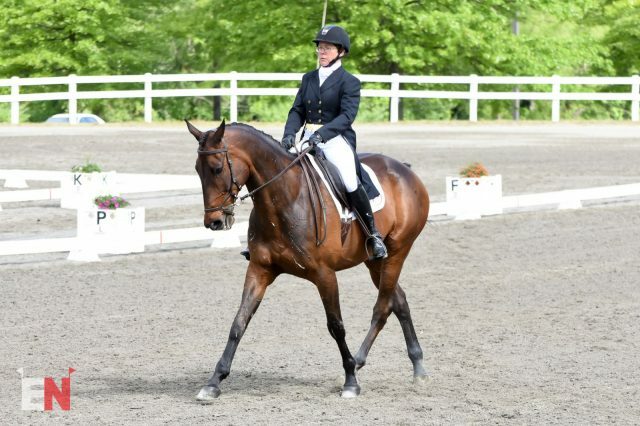 Marilyn and “Kitty,” a 12-year-old Oldenburg owned by Jacqueline Mars, Robin Parksy, and Phoebe & Michael Manders, won the CIC3* last month at The Fork, and came out swinging this morning for a 37.7 on the flat — just .01 above their personal best at this level. “When I went to The Fork I didn’t start out very quick. I wasn’t sure coming from Wellington how her fitness would be, and I was pleasantly surprised. I image she was (fitness-wise) where most horses are in the beginning of February looking toward Rolex. Since then we’ve been turning up the volume and adding hills and terrain that we didn’t have access to in Wellington. Looking at the course, I will be glad she’s getting fitter!” Marilyn continued. Phillip Dutton and Fernhill Revelation. Photo by Shelby Allen. “He’s getting better all the time. He’s a good, big, loose mover. It’s a case of getting him a little more balanced in the ring,” Phillip explained. “Warren,” an 11-year-old Irish Sport Horse owned by the Revelation Group, is using this run at Jersey Fresh as a final prep before heading overseas to compete at the Tattersalls CCI3* at the end of the month with stablemate Z. “Both Z and Warren are pretty close to doing a four-star, so I thought it would be a good stepping stone to go overseas and jump a course we haven’t done before,” he continued. Jordan Linstedt and Revitavet Capato. Photo by Shelby Allen. 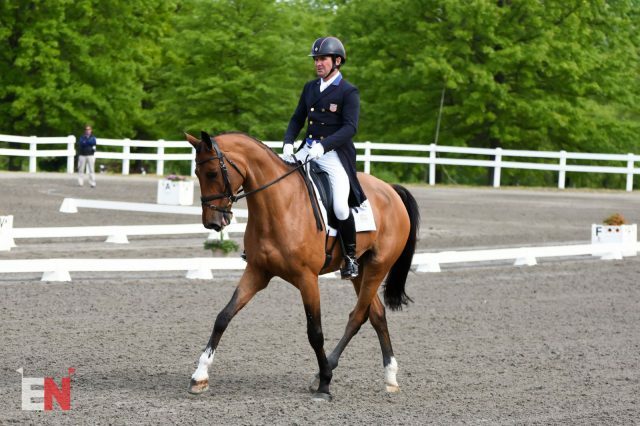 Revitavet Capato wasn’t quite right before cross country two weeks ago at Rolex Kentucky. 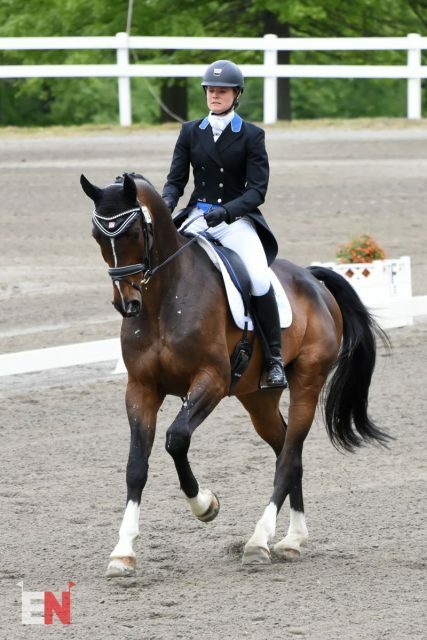 Jordan Linstedt being the utmost horsewoman she is, decided to withdraw “Capato” and get to the bottom of it, and they did. Feeling fit as a fiddle again after some additional maintenance, the pair rerouted here for another go. 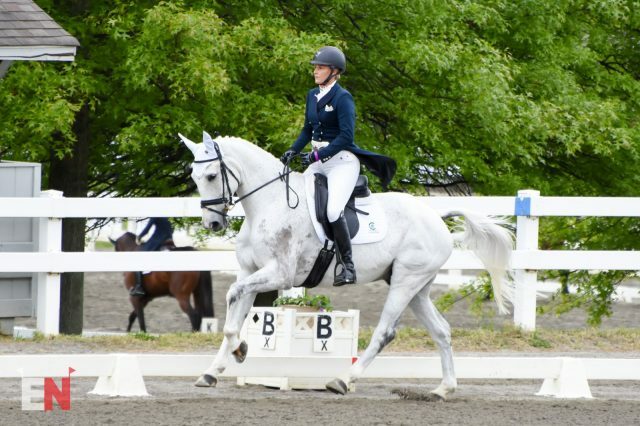 The flashy 14-year-old Hannoverian’s efforts today earned them a score of 42.9 for third place. Courtney Cooper and Who’s A Star. Photo by Shelby Allen. Also rerouting from Kentucky, are Courtney Cooper and her own and Neal Camens’ Who’s A Star who follow in fourth place. 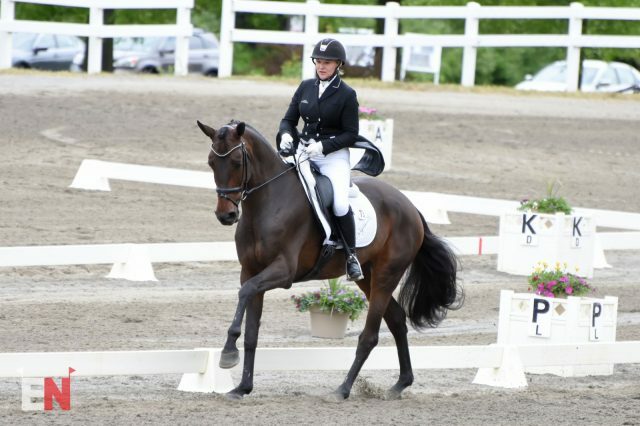 The 14-year-old Irish Sport Horse/New Zealand Thoroughbred cross earned a personal best score today of 43.4. Ryan Wood and Powell. Photo by Shelby Allen. Last year’s CCI3* champions Ryan Wood and the 11-year-old Oldenburg Powell continued their trend of only producing sub-50 scores on the flat, earning a result of 44.3 this afternoon. 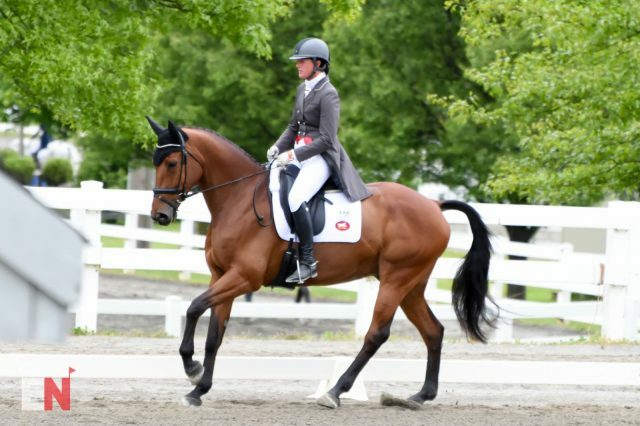 Bred in the U.S. by Ilona English, Powell is owned jointly by Summit Sporthorses and Ryan. Looking at the rest of the top 10, Buck Davidson and Carlevo are in sixth on 45.6, Tamie Smith and Dempsey hold a 45.7 for seventh, Boyd Martin and Testserleg sit in eighth on 46 points, Mara DePuy and Congo Brazzaville C earned a score of 47.5 for ninth and 10th goes to Will Coleman and Boris O’Hara with a score of 47.8. Besides Marilyn who has a very healthy five-point lead, the rest of the top 10 has a five point spread, which means in tomorrow’s rain, time points will be particularly influential. Lauren Kieffer and DA Duras. Photo by Shelby Allen. Fresh off her whirlwind trip to Kentucky and Badminton, Lauren Kieffer has earned a leading role aboard Debbie Adams and Jacqueline Mars’ D.A. Duras. 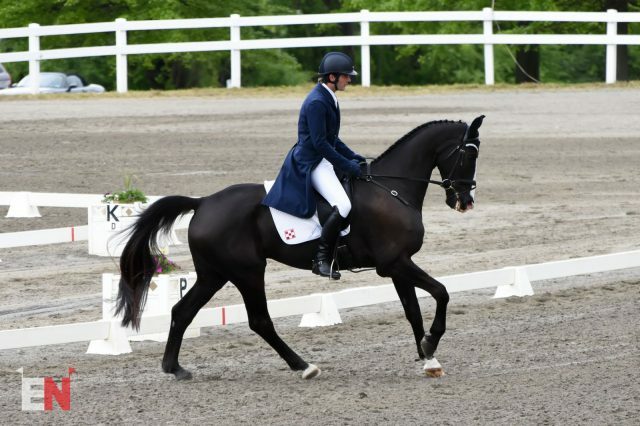 Duras is now quite an experienced horse, moving up to Advanced last year with Lauren before tackling both CIC and CCI3* level, and and this run should have him feeling fresh and confident before he spends the summer competing in overseas on a mark of 46.9. 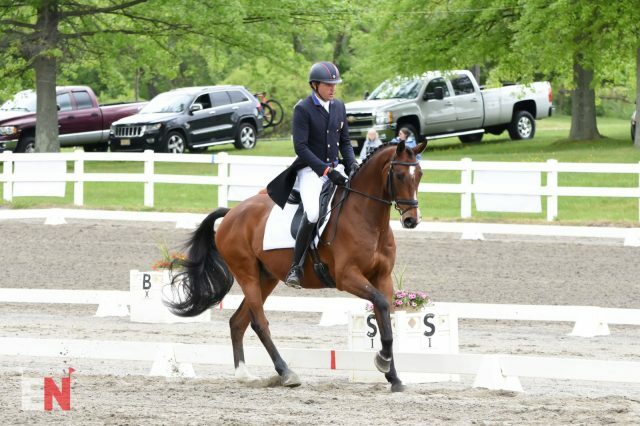 Boyd Martin and Long Island T. Photo by Shelby Allen. As the second to last rider of the day, Boyd Martin squeezed into second place with the Long Island Syndicate’s Long Island T. Boyd has done two CIC* divisions with his new ride, and this event will be their first two-star together, although the 11-year-old Oldenburg/Thoroughbred has completed eight CIC2* competitions with previous rider Peter Barry. “He’s a new horse for me. This is our first attempt at this level, so yeah I’m pretty nervous about it just because it’s taken a bit to get a partnership going with him, but he’s had really good runs the last couple of starts, so I think we’re in good shape,” Boyd said. Sara Kozumplik Murphy and Rubens D’Ysieux. Photo by Shelby Allen. Third place is shared by Will Coleman and Sara Kozumplik Murphy who both earned a score of 48.3. Will is competing this weekend aboard the Off The Record Syndicate’s Off The Record and Sara has brought Rubens D’Ysieux who is also owned by a namesake syndicate. Holly Payne Caravella completes the top five aboard Shelby Godfrey’s Bruisyard Hall on a score of 48.8. The rest of the top ten includes another pair who have rerouted from Kentucky, Sharon White and Cooley On Show in sixth on 49.4, Buck Davidson and Dutch Harbor are in seventh on 49.7 points, Jenny Caras and Fernhill Full Throttle hold eighth place with a score of 54.8, Young Rider William Zuschlag and RF Southern Command follow in ninth after earning 55.3, and the final rider in the top 10 is Molly Kinnamon with The Disel Boy on a score of 55.8. Tomorrow’s forecast refuses to look anymore favorable, so it looks like a super-soaked cross country day is unavoidable. The event is doing everything in its power to preserve the footing. Press Officer Ann Haller confirmed to EN this afternoon that tarps are being laid and secured across the takeoff areas of fences that are downhill or larger in side. This includes the fences 2, 3, 4 and 5 of the CCI3* course which are all in the first minutes of the course on mostly untrodden ground. The Ground Jury has also moved up and rearranged ride times with hopes to miss the worst of the weather. Cross country will now start at 8:30 am with the CCI3* division.